I love being a mom. I am so thankful God blessed me with two beautiful daughters. We are so proud of both of them. They obviously don’t live at our house full time anymore but their rooms are still their rooms and this house is still their home. When they come home, I try to always fix at least their favorite dinner or dessert one night. We try to spend every free minute with them and enjoy our family unit as often as we can. I realize they will probably never live at home full time anymore. 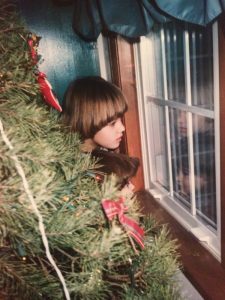 There are days I miss the “good ole days” of gingerbread houses and paper chain countdowns; carved pumpkins and trick or treating; cookies for Santa and reindeer food. Sometimes I still miss McDonald’s after softball games; pow wow’s in our designated seats after basketball games and watching the Disney Twelve Days of Christmas while decorating after Thanksgiving. Yes, I know they may never live here full time anymore, but I still get excited when they come home. I still “pretend” they believe in Santa Claus. I still make cut out cookies for special occasions, and I still love every minute of my time with them. They don’t need me like they used to. I don’t need to plan parties and provide entertainment like the old days. But I still prepare our house for their homecoming with WELCOME signs on the door and brownies on the counter. I do love being a mom. I love going home to my old house and seeing my own mom (and my dad as well – haha), and I hope my girls will always love coming back to see us. Ahhhhh…….Home Sweet Home – where the door is always open and the hugs are always waiting. John 15:9 – As the Father has loved me, so have I loved you. This entry was posted in devotional, inspirational, motivational, spiritual on November 9, 2016 by Deanna Young.